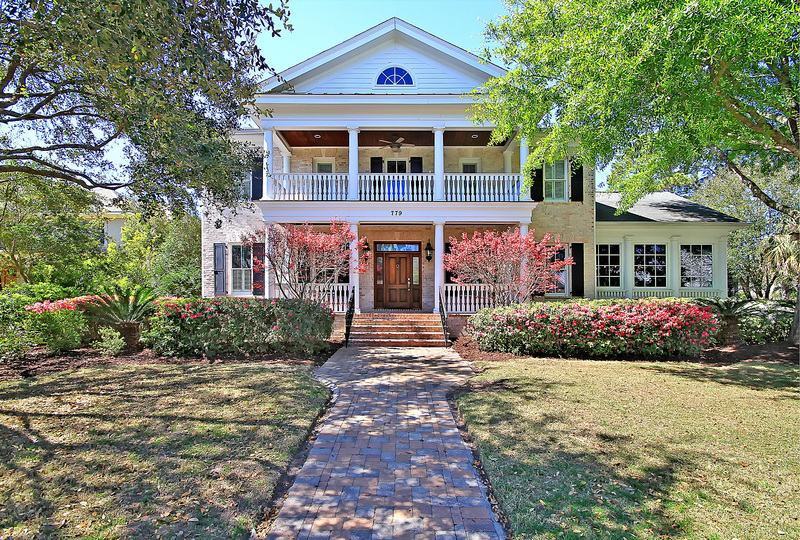 Step into this elegant brick home located in the exclusive Olde Park neighborhood, just minutes from downtown Charleston and Sullivan's Island/IOP beaches. This home showcases high end upgrades such as a chef's gourmet kitchen (remodeled in 2016) and an open concept floorplan that is ideal for entertaining. There are dual masters, with the downstairs master suite featuring its own separate sitting room with a fireplace and classic stone mantle. Step into the backyard living space from the screen porch, out to a gorgeous mineral salt pool, open cabana with copper roof and wood burning fireplace, along with a deluxe island grilling/cooking area. A separate staircase leads to the poolside FROG with a living area, bedroom and full bath, and which is also accessible from the main house. This is luxurious living at its finest. 3rd garage bay with indoor/outdoor carpet is converted to temperature controlled weight room/gym/storage area, and is easily converted back to a 3rd bay. The moment you arrive at this custom brick beauty, you will know that quality abounds throughout. This single level 4 bedroom home plus FROG sits on a gorgeous lot with trees and protected wetlands in back which provide privacy, quiet and tranquility. Morning light streams into the foyer and dining room, and the grand pillars and vaulted ceilings accentuate the open floorplan and feeling of spaciousness. This special home features 4 bedrooms and 3 full baths on the main floor, with a FROG as a 5th bedroom upstairs. It is truly a gem, and is a 'one of a kind' floorplan in the neighborhood. The updated kitchen with breakfast area features gorgeous granite counters, new appliances, a large center island, and opens to the screened porch that overlooks the patio, rear yard, and trees. The formal dining room, with its glistening chandelier, is large enough to host those special gatherings throughout the year. The spacious great room is truly grand with vaulted ceilings a woodburning fireplace, and view to the private rear yard. Retreat into the large owner's suite where the bath includes a garden tub, separate shower, dual sinks and loads of natural light. This home has been consistently and meticulously maintained, and features a new roof (2017), new appliances, rain gutters, lovely landscaping, updated lighting, custom paint, vaulted ceilings, large laundry room with utility sink/cabinetry, and gorgeous nighttime exterior up-lighting. Neighborhood amenities include 2 pools, lighted tennis courts, clubhouse, walking trails, boat ramp and boat storage (upon availability) Brickyard Plantation is close to IOP beaches, Towne Centre, restaurants shopping, and Roper St. Francis' Mt. Pleasant Hospital. See our most recent sale in Hamlin Plantation in Mt. Pleasant!.. Enjoy a 'Lowcountry Lifestyle' in this gorgeous 4 bedroom, 2.5 bath home in desirable Hamlin Plantation! This special property sits in one of the best locations in the Waverly section, and offers peace and quiet with its view of the woods & peek-boo-view of the natural pond from the back, and its view of 'Savoy Green' from the front. Observe the array of wildlife from the privacy of your large screened porch, including the visiting herd of deer. This is truly Lowcountry living at its best. As you enter through the front door into the foyer, you will sense the quality and attention to detail throughout this beautiful home! Neighborhood amenities include pool with water slide, tennis courts, volleyball, walking trails, fitness center, clubhouse, play park. Our most recent video highlighting real estate sales activity in Mt. Pleasant during the 1st Quarter of 2018 is out! Please let us know if you have any questions we can answer!